I read some of Edgar Allan Poe’s Tales of Mystery and Imagination last year and , although I found the Tales themselves a bit disappointing, I became interested in his life. 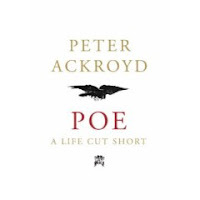 So I listened to BBC Radio 4’s Open Book programme this afternoon when Peter Ackroyd discussed how Poe’s strange obsessions and troubled relationships with women affected his life, and outlined the mystery of his death. Ackroyd’s biography of Edgar Allan Poe is due out on 7 February this year and it’s going on my wishlist. The programme gave me more insight into Poe’s work and made me think I’ll go back to the Tales. Ackroyd talked about Poe’s life and character. Apparently he was a difficult person to understand or to like and was accused of being a hypocrite and a liar. He lived a life of penury and misery and his obsessions were reflected in the themes of his Tales – death, illness, premature burial, decay, and a sense of doom. He earned very little from his writing, either as a critic, or as a poet despite the success of his poem The Raven. Louise Welsh, Kim Newman and Diane Roberts were also taking part in the programme. Apart from being the first Amercian writer of gothic horror, Poe is also credited with inventing the literary detective through Dupin, and the beginnings of science fiction, in Words with a Mummy which recounts how an Egyptian mummy is electrified (through its nose! ), opening its eyes, blinking, etc and eventually speaking, in Egyptian of course! I must read that one. Poe’s work is both dark, ironic and claustrophobic, conveying as it does the fear of constriction in confined and dark places. I remember vividly my horror of waking in the pitch blackness of a two-man tent way out in the countryside, far from street lighting and my panic as I tried to get out. Poe’s work has a cultural afterlife – through films of his stories and in music. Alfred Hitchcock was influenced by Poe’s work as was Stephen King and other authors such as William Faulkener, in such books as The Sound and the Fury. Modern authors have tried to solve the riddle of his death but as Peter Ackroyd said it is still a mystery and it was “an unhappy, unfortunate death to end an unhappy unfortunate life.” Last year I read The Poe Shadow by Matthew Pearl and I think Ackroyd’s biography should be an interesting and more factual account. Louise, Kim and Diane recommended the following stories for someone who has never read any of Poe’s tales: Ligeia, William Wilson and The Fall of the House of Usher. Ligeia is unknown to me and I’ll try to start my reading of Poe again with that one. Louise Walsh said that it was about the dangerousness of learning. Very interesting. I always enjoy reading studies of the authors lives, and looking at the way their background informs their writing. Can an obsession really be squeamish? Yes, I heard the programme as well and resolved to read the Ackroyd. I do wish he wasn’t so prolific as I love him so much I feel obliged to get hold of everything he writes.